VGA stands for Video Graphics Array. A VGA cable is a cable connector used to transfer video signals. These cables are used with computer, laptops, projectors and televisions. The video graphic cable comes in two types, male or female connector. VGA cables works by carrying the electronic signals and data from one hardware device to another. The signals are normally in form of video signals. 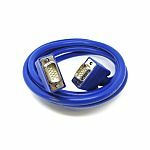 VGA cables are used to connect monitors to a personal computer, TV screens or laptops. 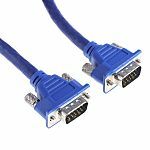 VGA cables are designed with an HD-15 connector female or male depending on connection requirements. Are there different types of VGA cables? 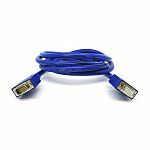 VGA cables come in different variations depending on application, lengths and colours. 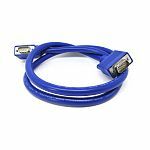 We offer a variety of VGA cables, male to female, male to male or male to fly leads. RS offer VGA cables in black, grey and blue, sizes vary from 2m to 30m and additionally the cables have double shielding. 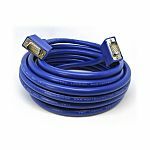 A video graphic array (VGA) cable carries analog signals and supports video resolutions up to and including 640 x 480. A super video graphic array (SVGA) cable carries analog signals and supports high-resolutions up to and including 800 x 600. What are they also known as? VGA cables are a vital component when setting up computers to monitors, projectors and high definition television sets. On laptop computers or other small devices a mini-VGA port may be required in place of the full-sized VGA connector.